The book will continue to be available. For now, it is on Kindle. Publisher Malcolm Harris of Parkside Publications tells me that he expects to have it up on Apple and Barnes & Noble soon. The ebook edition has all of the features of the hardbound, including the nearly 200 photographs, the chapter notes, the solo transcriptions, the discography, the extensive index and Dave and Iola Brubeck’s foreword. The ebook edition is easily portable. The most frequent complaint about the five-pound, 10-and-a-half-by-11-inch original was, “How am I supposed to read this thing on an airplane?” Now you can, after the pilot says it’s okay to fire up your Kindle, iPad, Nook or Sony Reader.  The ebook sells for less than a third of the list price of the original hardcover edition. Desmond was fascinated by electronic technology. We can only imagine his delight if he knew that his life story had been digitized. To order the Kindle edition, please go here. To listen to Paul sounding the way he looks above, play this video. Summertime, CTI, 1968. Paul Desmond, alto saxophone; Herbie Hancock, piano; Ron Carter, bass; Airto Moreira, drums; Joe Beck, guitar; Wayne Andre, Paul Faulise, Bill Watrous, Kai Winding, trombone; John Eckert, Joe Shepley, Marvin Stamm, trumpet; Ray Alonge, Tony Miranda, French horn; Don Sebesky, arranger. 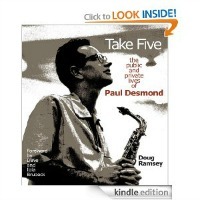 Even though I have (probably) all of Paul Desmond’s recordings, including Summertime, I never get weary of hearing more. Thank you. Would Make a fine xmas present on any jazzbo’s coffee table OR, now, tablet/Ipad………..Highly recommended. How well I remember playing Take Five. Summertime brings it all back. Ron Carter wasand still isone of two or three bass players that made me sing. (I’m retired from playing my bass, sad to say; the eighties ask alot of bass players, who carry their giants wherever they go to rehearse or perform). Back to “Take Five:” I first played it to an audience of 2,000. They went wild when we came to its end. They were taken away with the phenomenon of 123/45, 123/45. All the best, Doug; and thanks for this one.